Speed & Combat. Despite the bad forecast of rain and wind we managed to have a good day of speed flying with the usual regulars turning up for some fun. We are lucky at Frankston field as we have a good windbreak which enables us to fly ok when it appears to be no good. We must never cut down the foliage on one side of the field; I might go and fertilize it !! I would like to thank the guys that turn up to fly as well as our chief timekeeper Ron Savage and Masterchef Mark Ellins on the day. Robin preps a speed model for flight. I believe if a comp is listed we should make all effort to fly as if we don’t people may not turn up next time. I flew my class 5 for 2 flights a bit slow then Noel and Andrew flew their Perky Speed models, Andrew being the fastest, mine was the slowest. Andrew then flew my old FAI model 1970’s with a cheapo Russian UCTHAM 15 which went surprisingly well and reliable in Classic FAI. I also flew my 1976 World Championships upright Speed model with a Moki s6t 15 piped but was a bit slower although very easy to operate. Both will go better with development just for fun ! Harry Bailey flew his OS PS11 and ASP 12 in Class one, the OS was faster. 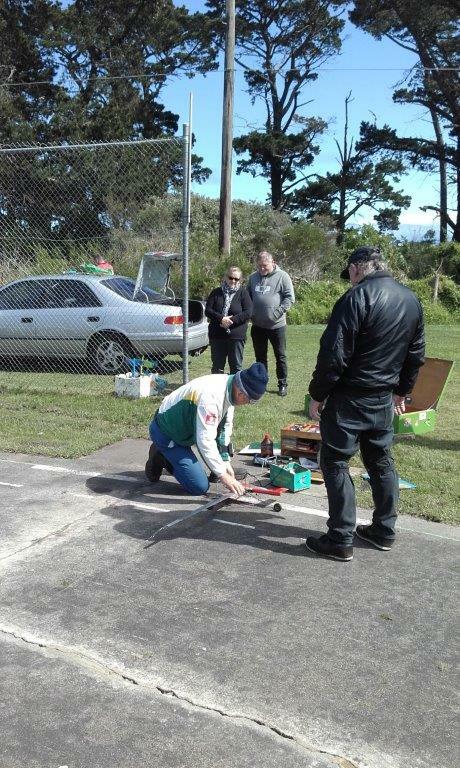 Harry also flew in 1/2 a Proto Speed with an OS10 as did Ken Hunting our eventual winner. Noel flew his Chatterbox Vintage Proto this time with an Enya 29 but sounded like needs more compression and had a very bouncy landing with the wing breaking loose in the fuselage; easily fixed with glue. Next comp is in November and the field should be dry by then.